The extension of tax concessions comprising capital investment and freight subsidy to Himachal Pradesh and Uttarakhand has come as a severe blow to Punjab. At a time when the state is struggling to get new investment and contain the flight of industry to tax-exempt states, the development will only make the going tough for Punjab. Punjab has been the worst sufferer of regional economic disparity arising out of “preferential” treatment to hill states in its vicinity, Himachal Pradesh, Uttarakhand and Jammu and Kashmir. The Centre with a view to accelerating growth in these states, offered them tax concessions without realising that the move would make investment in Punjab unviable. But just as Punjab was hoping that tax concessions would not be extended, the Centre has gone ahead with the move. While the concessions for Jammu and Kashmir were extended in June, Himachal Pradesh and Uttarakhand were given an extension yesterday. The package was withdrawn from both the states in March 2010, but concessions on capital investment, which entails a capital investment subsidy at 30 per cent of the value of plant and machinery and a freight subsidy (75 per cent subsidy on transfer of goods from the production unit to the designate rail head), continued till January this year. These have again been restored. 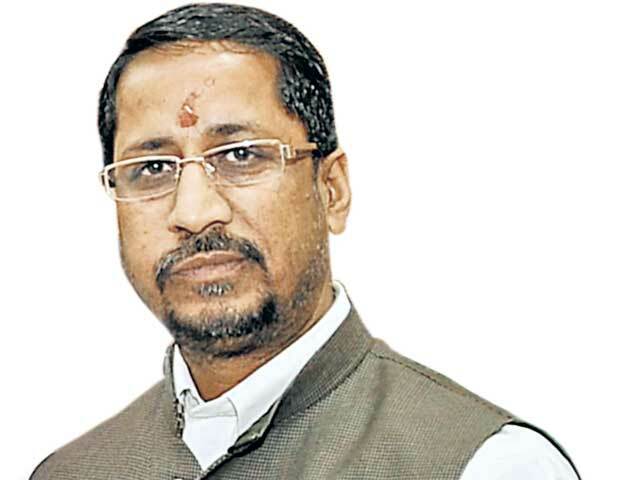 Punjab Industries Minister Anil Joshi told The Tribune that the move was discriminatory. “This shows that the Congress-led UPA government is hell bent on wiping out industry from the state. 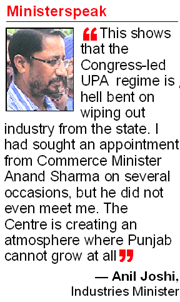 I had sought an appointment from Commerce Minister Anand Sharma on several occasions, but he did not even meet me. The Centre is creating an atmosphere where Punjab cannot grow at all,” he alleged. Punjab is witnessing a phase of low growth. Industrial investment has been on the decline. The contribution of the manufacturing sector to the Gross State Domestic Product (GSDP) is 6.8 per cent. In the past two years, the state’s industrial growth has remained stagnant. The state government had recently announced a slew of fiscal concessions to fresh investment as part of its new industrial policy. But this extension of sops to neighbouring states will negate the concessions offered by the state government. Gunbir Singh, member, CII National Council on Governance, and a businessman from Amritsar, said the move was unfair. “Punjab has seen shifting of industry and investment to these hill states. Even Punjab-based units have relocated in these tax-exempt areas to reap the benefits. Given the need for fresh investment in Punjab to give boost to its economy, this extension is a major setback for the state," he said. It may be mentioned that the Ministry of Finance was not keen on extending area-based exemptions to the north-east and hill states as the revenue foregone because of these exemptions was Rs 18,500 crore in 2012-13. The total subsidy received by Himachal Pradesh till March 2013 was Rs 156.27 crore while the subsidy received by Jammu and Kashmir was Rs 106 crore. Challenging the grant of tax sops to the hill states in the Supreme Court, the Punjab Government has maintained that 274 industrial units, involving an investment of Rs 3,679.79 crore, moved out of the state because of tax concessions in the neighbouring states. Ludhiana was the worst-hit with investment worth Rs 2,027.34 crore shifting to other states while Malerkotla lost an investment of Rs 742.50 crore and Gurdaspur/Batala suffered a loss of Rs 461.11 crore. The total investment shifted out of Amritsar was Rs 188.50 crore. The units that moved out of Punjab dealt with the textile, steel and pharmaceutical sectors. The state government has also maintained that because of this reason, there has been a considerable decline in central excise contribution from Punjab. From Rs 2,786.46 crore in 2003-04, the collection fell to just Rs 661.83 crore in 2010-11. Information accessed from the approved annual plan of Himachal Pradesh reveals that since the industrial package was announced for the state in 2003-04, the state received investment worth Rs 13,509.77 crore with setting up of over 3,800 industrial units. The contribution of industry to the GSDP in Himachal Pradesh is 16 per cent as against 6.8 per cent in Punjab and the per capita annual investment has risen from Rs 2,196.45 to Rs 4,442.25. This shows that the hill state has been growing rapidly ever since the industrial package was announced. DL Sharma, president of the Punjab state council of the CII and the Vardhman Group, said new investment would continue to go to these hill states as the capital incentive subsidy was huge. The freight subsidy would also continue to make these states far better place to do business, he said, adding that the Centre could have at least granted these sops in the border districts of Punjab. CM Virbhadra Singh in Shimla. Union Commerce and Industries Minister Anand Sharma on Sunday announced continuation of capital investment subsidy and transport subsidy to Himachal Pradesh, sanctioned new projects involving an investment of over Rs 170 crore and granted in-principle approval to seven more projects worth about Rs 165 crore. The capital investment subsidy to the state, which expired on January 7 this year, would now continue till March 31, 2017, and a new more liberal scheme would replace the existing transport subsidy scheme. The capital investment subsidy was a major component of the expired industrial package. Regarding the exemption in excise duty and other components of the package, Sharma said Chief Minister Virbhadra Singh had made a strong case and his ministry had made a favourable recommendation for restoration of the package to Himachal Pradesh and Uttarakhand. Sharma had also taken up the matter with the Prime Minister and the Finance Minister. Sharma also announced setting up of the first regional centre of Indian Institute of Foreign Trade, Kolkata, for capacity building of small and medium enterprise near Shimla at a cost of Rs 30 crore. The state government will provide 5 acres for the institute, which would also offer part-time MBA and other courses. The new schemes sanctioned included a Rs 16.5-crore apple juice concentrate (AJC) plant at Gumma; Rs 12 crore project to upgrade of AJC plant at Parwanoo; a Rs 27 crore warehousing project, Rs 8 crore composite pharmaceutical testing laboratory and Rs 11 crore container parking facility -- all at Baddi; Rs 12.34 crore electrical infrastructure development project and Rs 20 crore common effluent treatment plant at Kala Amb and Rs 16.35 crore power supply up-gradation project for Baddi. Sharma said the ministry had granted in principle approval to seven more projects that would be sanctioned after the state completed the required documentation. These include a Rs 15-crore common effluent treatment plant at Taliwal; Rs 20 crore Gondpur road up-gradation project; Rs 15 crore project to strengthen power transmission and distribution system in Taliwal; and a Rs 15-crore power infrastructure project for Paonta Sahib. Besides, three integrated townships have also been proposed to be set up at Pandoga in Una, Dabhota in Solan and Kandrori in Kangra at a cost of about Rs 100 crore. He said work on the Rs 17-crore spice park at Nadaun that was delayed due to the failure of the previous BJP regime to provide land would start soon. An extension centre of the park would be set up in Sirmour district.